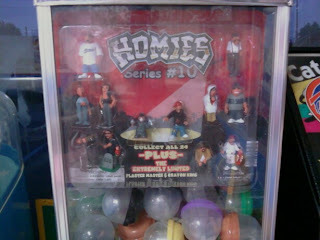 Happy Meal and I drove to meet Ugly Bag of Mostly Water in Diamond Bar. He was visiting Riverside, CA from FL, and Diamond Bar was the halfway point. Besides, Continental Burgers got a kickass review on Yelp. That's right...TheBurgerBusters will fly all the way across the continent just to sample a burger. We have unlimited funds and amazing health insurance. Ugly Bag of Mostly Water has been having a monthly RotoRooter-type service for both his coronary arteries and his colon for about 4 years now. Oh, they use the same hose, because he is just that tough. Keep in mind that it was 103 degrees in Diamond Bar, CA, and Continental Burgers did not have the AC working, so it was also103 degrees inside Continental Burgers. On the plus side, the toy vending machines in there had stuff that you wouldn't find elsewhere---my favorite was the "Limited Edition" Cholo figurines (Homies)--no kidding. I got the double cheeseburger, since the patties looked to be thin enough to shave with. What was odd, was that this joint served Mexican food, so they griddled plenty of chorizo that day (it was on the menu), and that was where burgers should have been cooked--on the griddle in a pool of salty, orange, chorizo fat. The gooey, American cheese and untoasted bun sort of saved the burger in terms of moisture, since a toasted bun would have turned this into a giant dust bunny. Sadly, the cheese did not get enough salt into the mix, so mustard and salt were needed to save this bad boy from complete blandness. Somehow, this thing ended up being crazy filling and pretty satisfying. 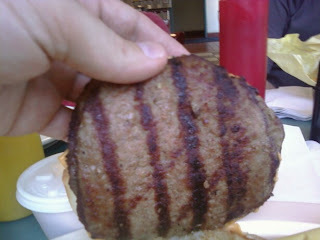 It was a lot like the burger at Jim's Burger Haven in Denver, CO, but it was grilled instead of griddled. The standard, seeded burger bun was generally pleasant and nutty big and flat. The Yelpers were completely crazy over the fried zucchini--Ugly Bag of Mostly Water and I agreed that it was nothing to write home about. 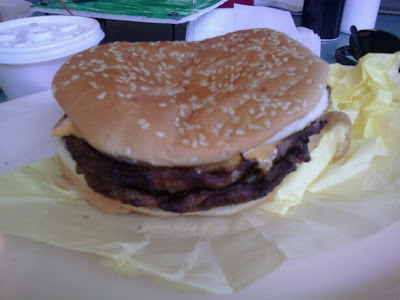 Burger Review --This burger was pretty good--not awesome. That looks nothing like what they serve. What did you order? 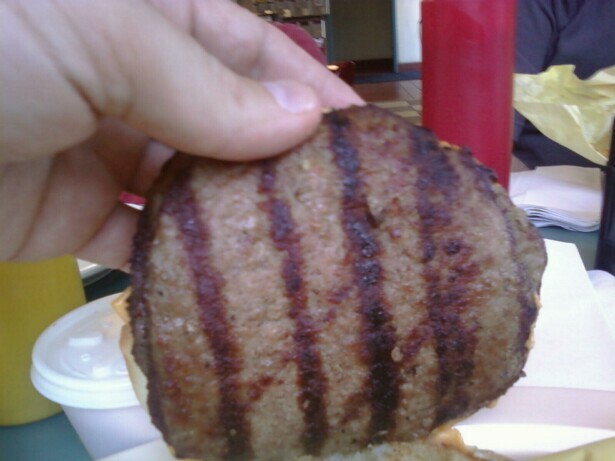 a burger with nothing on it? You my friend are slow and incompetent. It sounds like somebody needs a hug. Danny, Danny...do you want a hug? That was precisely what they served. I ordered a plain cheeseburger with everything on the side. I like to taste the basic elements before I tart the cheeseburger up with toppings.